The art of dining well is no slight art. Yet amidst the throng of cocktails and clattering heels down Call Lane, just before the railway bridge, Arts Cafe have mastered it. 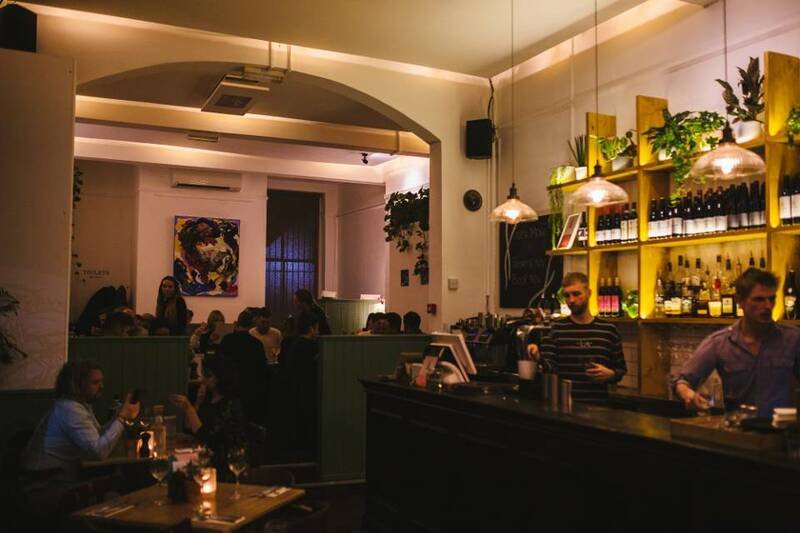 As one of Leeds’ original independents; the bar, come gallery, come restaurant, (now simply Arts), has taken on new direction for the first time since opening in 1994. With a softer, more streamlined branding, the neighbourhood destination has been brought up to date by the New Citizens team, now racking up an enviable portfolio of venues, markets and events across the region. Inside, it’s a lighter, sleeker look. The white high ceilings and sage wainscot complement flashes of dusty pink, and greenery from Corn Exchange based The Plant Point, tumble down the walls. This month they’re showcasing large colourful oil washed canvasses from Artist Emily Barlett, and aim to rotate local students’ work on a monthly basis. The abstract energy of her pieces would be at home in the Hepworth, but the space, little table cacti, tableware; nothing feels like it’s trying too hard. The service is relaxed and attentive, just a pair on front of house moving deftly around the long room, refilling water before you have to ask, talking through the drinks selection with ease. Tonight’s guest ale is Ilkley Fruition, an apricot and passion fruit IPA, and on the other tap – a Sevillian Cruzcampo Lager. I opt for a glass of Sangiovese, helpfully labelled under the Medium/Full Bodied section of the wine list. Rich and damson red, it’s the perfect antidote to the cold snap outside. The Arts Leeds menu is more refined too. 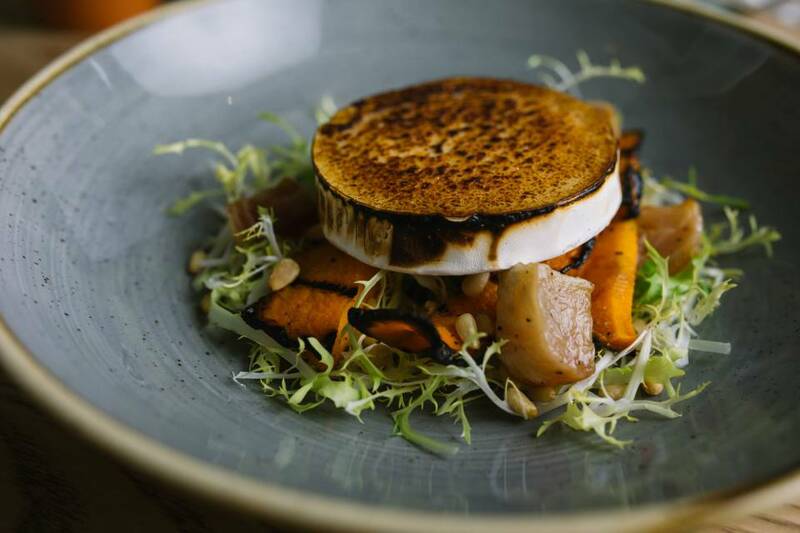 Plates are well balanced; classic flavours that work well together; Thai fishcakes and sweet chilli jam, a roast squash salad with beetroot, pine nuts and goats cheese, rib eye steak and pepper sauce. Arts could knock a few things off the A La Carte, and you’d still be spoilt for choice. I have to stop myself ordering the root vegetable crisps and wasabi peas on the snacks list. Everything appeals. Mussels come stacked above a garlic cream broth, rings of spring onion caught inside each mirrored shell. Alongside the bowl; hefty wedges of homemade granary bread, dense and porous for sopping. My courgette, cumin and spelt fritters are dark egg-shaped koftas, with crisp coats and moist middles; the beautifully dressed leaves under the trio wavering the need for any kind of dip. Scattered with expertly toasted cashews, (we’ve all forgotten our nuts in the oven), this, the vegan starter, makes for an impressive initiation. Next, one of the specials: Moroccan lamb rump, blushing on a bed of giant cous-cous and harissa yoghurt. The chargrilled halves of aubergine are stretched out on top, curling at the corners with an emphasis on the char. The meat is tender, blackened too on the outside. There are no off putting bubbles of foam, but sense of a real delicacy to chef John Wilkinson’s touch. Perhaps the re-launch has given the kitchen artistic license to cook what they themselves would like to eat. I know what I like to eat, and it usually can’t be beaten by popping an egg on top. 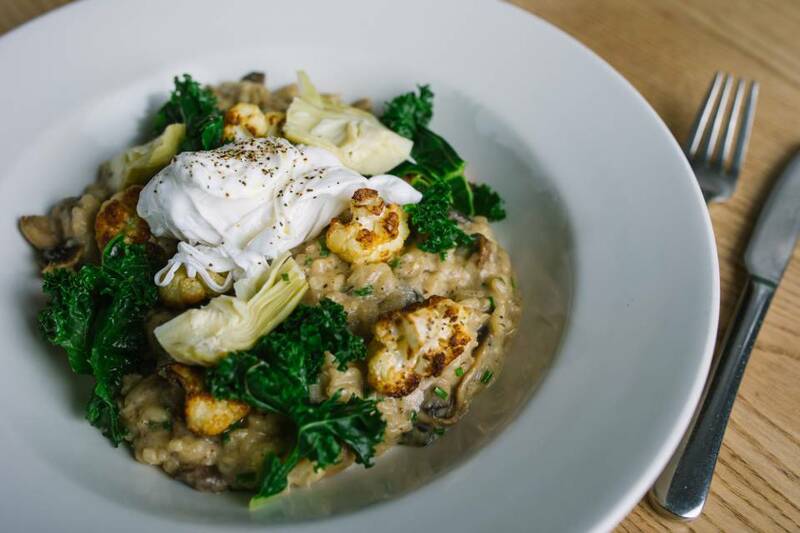 Thus, the wild mushroom and truffled cauliflower risotto is right up my street. It’s earthy and comforting, leaves of kale folded through the mound, which golden egg yolk dribbles through. The pickled artichokes hearts are a sharp counter, but a little too briny and citric for my liking. The table next to us comes in for drinks. It’s a Friday night after all. The mellow soundtrack now reverberates more with the chink of laughter, and Arts take it all in it’s stride. As we tuck into a crumble, our evening seems no less hedonistic. The oval dish is filled to the brim with a crunchy cranberry studded muesli on which sits a scoop of Northern Bloc’s Hazelnut & Rose ice cream. As a NB regular I know it’s a vegan flavour, but again my ethical stand point was nothing to do with the choice of pud. With hot soft plums against melting cream, it’s a breakfast inspired end to a meal that hit the season bang on. Maybe it’s Arts’ proximity to the high street shops, or the fact that I’d have been happy with choosing pretty much anything on the menu, but it strikes me that the dishes might be slanted towards a female palette. Lots of fish and veggie choices… a need for brunch cocktails. Perhaps the team are conscious that this is Call Lane after all. However, opening the door on to the thrumming pavement, you realise what meal-time tranquility you were in. We skip through the crowds happy bellied and in the knowledge that we’d be back with friends and family looking for a little creative cookery without the pretence. Arts Leeds Review written by Sarah Cotterill, photos by Arts Leeds.